CM: A 'tapestry' is a handmade wall carpet without pile, embroidered with scenes similar to painting. It originates in the East, mainly from Egypt, Persia and Syria. It arrived in Europe in the Middle Ages and quickly became the basic decorative artefact of palaces in France, Germany, Italy, and Spain. Onwards from the 18 th century, however, the art of tapestry declined. Lefteris Kritikos is self-taught in the field of tapestry. Owing to his childhood memory of women who create rugs, when in 1976 at age 28 years, he came across a horizontal loom, he set himself the goal of learning to use it. And he remained faithful to this art from since that time. The art of tapestry is arduous because the horizontal loom recruits both legs and arms. 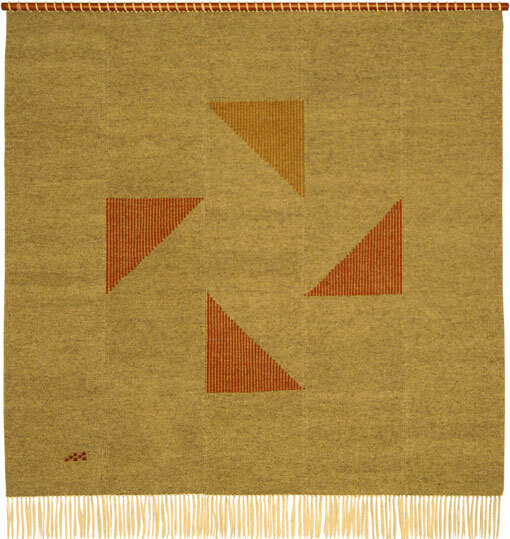 Based on Greek tradition, in which textiles are dominant, Kritikos elaborates on tapestry as if it were a rug. He likes to work in the traditional way with the old methods and techniques, but to express new things. The warp is cotton and the weft is wool. The present work is intended for the decoration of a wall. A horizontal wood in the color of terracotta supports the tapestry in the upper part from the fringe while leaving its body to hang freely downwards. Kritikos designs are modern. Kritikos draws the composition on a maquette and freely transfers the design by means of weaving. He returns to the themes that interest him each time in a different way. The Windmill presents four triangles that occupy the four points of a rhombus as if turning around a circle. Aided by their imagination, viewers perceive sails of a windmill. The colors he chooses are earth tones - the lower three terracotta, and ochre above them. The background is wool in natural gray and beige tones.